News dropped from a tweet on Tuesday morning that a KHL club has poached a couple of potential restricted free agents in Dustin Boyd and Nigel Dawes, signing them to brand new deals. Both Boyd and Dawes finished the 2011 regular season as members of the Montreal Canadiens organization, but neither found regular ice-time in the NHL, likely prompting a move to some more ice-time with a better quality of players. Boyd only managed to play 10 games with the Habs in 2011, scoring 1 goal. Dawes split time between Atlanta and Montreal in 2011, playing 13 games and picking up a single assist. Neither player had much for fantasy value for the 2012 season. The Florida Panthers took care of one of their outstanding restricted free agents before the July 1st deadline on Monday, as they re-signed forward Jack Skille to a 2-year deal, reportedly worth $1.65 million, an $825,000 cap hit per year. Skille was acquired by the Panthers from Chicago around the trade deadline and he managed to get into a fair number of games between the two teams in 2011. In 62 appearances, Skille finished with 8 goals and 11 assists, finally drawing into the top 500 in pool scoring. Of course, that's still a long ways from being pool worthy, but there is some faith being shown by Panthers' management, stemming back to Dale Tallon's days in Chicago, so he might be up for good in 2012. Skille is only the fifth forward signed onto the team going forward, one of 10 players signed for the 2012 season. Currently, the Panthers continue to have the lowest projected cap hit of all 30 teams, sitting at only $17.3 million. It's here! It's here! We can finally start talking about the Stanley Cup Finals, as the long-standing break between the end of the Bruins and Lightning series and Game One has almost passed. In the East corner, we have the number three seed, Boston Bruins. The Bruins edged their way past the Canadiens in seven games in the first round, swept the Flyers in the Conference Semi-Finals and outscored the Lightning in six games in the Conference Finals, to get where they are today. In the West corner, the President's Trophy winner and number one seed, Vancouver Canucks. Te Canucks exorcised some demons in seven games against the Blackhawks, rallied past the Predators in six games in the Conference Semi-Finals and worked over the Sharks in the Conference Finals for their third trip to the finals, ever. The match-up is a good one, as both teams were tabbed as early favourites at the beginning of the regular season and again at the beginning of the playoffs, as both tooled up well in the off-season and again at the trade deadline to really make a splash in the playoffs. Possibly, the right word to use now is... cannonball! The Bruins will be coming with their relentless physical play and runs to the net, while the Canucks will continue to work with their puck possession game, mixed with a dump-and-chase forecheck attack. The goaltending match-up looks to be about even, the scoring throughout the pool looks to be about even and their momentum going into Game One will collide like a pair of runaway trains at high speeds. This has the makings of being one legendary series. So, how will it all play out in the hockey pool? In the four previous years, there has only been one come from behind victory going into the Cup Finals and that was in 2009, when the winner came back from 5 points down to take the first place money. In 2011, I have a hard time seeing a major comeback this year, since the Langdon River Dogs have a better scoring team on the Boston side of the ledger than Tryst'n'Grant or even All She Wrote, so from here on in, it looks like it will take a miracle to dethrone the Dogs. All She Wrote is counting on Tomas Kaberle to outscore Johnny Boychuk by 16 points in the Finals for 2nd place, which seems highly unlikely. Pucking Luck holds down the 4th place money position, but comparing their team to most teams down the line in the top 10, if Roberto Luongo dominates this series, they'll be out of the money and likely out of the top 10. 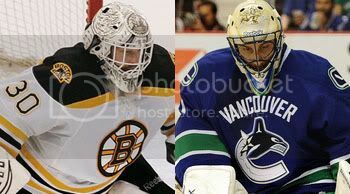 Pucking Luck would need a Bruins sweep and a major series from Michael Ryder to stay in the money. Seaherwet has an excellent chance of staying in the money, provided Ryan Kesler can outscore Luongo and/or the Patrice Bergeron and David Krejci combination go to town. Outside of the money, I like the chances of Kalenab, Granny Smith and the Thieves on the Cheechoo Express to make a run for the money, they have the right combination of Bruins, which could separate each other, especially if this series goes deep. It looks like we'll have a great finish to this year's edition of the pool. Previous Stanley Cup Final previews in the hockey pool, for your amusement... 2010, 2009, 2008 and 2007. The record for GWGs in one playoff year by a team is 22, which would mean that the record could be tied if this series went at least five games, broken if it went six or more games. The Langdon River Dogs and The Kings Don't Pay Their Bills both lead the pool with 17 winners, but they are a long way off of the overall record, which was set back in 2009. If the Sedin twins were to make a big leap and win every game for the Canucks, most teams would come very close to the record, but there is only a faint possibility that it would be the case. David Krejci leads the pool with four GWGs, Nathan Horton has three, Ryan Kesler, Michael Ryder and Daniel Sedin all have two winners, outlining the leaders that are still in these playoffs. The biggest news going into the series is that the Canucks will be two bodies healthier than when they won the Western Conference Finals over a week ago, as the team is likely going to see the return of Box 8 forward Manny Malhotra and Box 9 defenseman Christian Ehrhoff. Malhotra is returning from a major eye injury, which forced him out of the last few weeks of the regular season and the first three rounds of the playoffs, while Ehrhoff has been nursing an undisclosed injury, missing out on the last couple games of the series against the Sharks. The biggest impact these two players can have on the hockey pool is helping Roberto Luongo get to his four wins in this series. Well, I'm ready for this series to get going, I don't know about you... can it be Wednesday already, please? The Edmonton Oilers took care of one of their top priorities this Summer, re-signing forward Ryan Jones to a new 2-year deal on Sunday afternoon. The deal is reportedly worth $3 million over the duration of the deal, which works out to be a $1.5 million cap hit per season. Jones was scheduled to become an unrestricted free agent on July 1st, but as expected, he was tipped as one of the more important pieces of the team going forward, bringing some versatility to the line-up, playing in some top six, but generally bottom six roles. In 81 games for the Oilers, Jones finished with 18 goals and 7 assists for 25 points, not one of the higher scoring forwards in the league, but his physical play and forechecking was quite noticeable, making his value to the team much higher in the season. As the team begins to mature around him, I would expect to see his offensive numbers rise up a little bit more, possibly to a point where he could be taken in some hockey pool drafts. In 2011, Jones finished 234th among forwards in scoring, where 160 forwards were actually taken in the draft. As outlined in the Pool Outlook a couple weeks ago, the Oilers are in fantastic shape, in terms of cap hits and such and Jones' $1.5 million hit will fit in quite nicely as well. Currently, I have the Oilers up at $39.1 million for 16 players and one buyout, which leaves them plenty of room to possibly acquire some more veteran help to aid in the development of their youth. Expectations for the defending Stanley Cup champions had to be tempered in 2011, knowing full well that the team would have to do some serious remodelling to their line-up, thanks to some extra large cap concerns. Expectations were still rather high for the core of the team that remained for the 2011 season, realizing most of those expectations by just barely sliding into the Western Conference playoff picture in 8th spot. The match-up against the Canucks in the first round was quite the nailbiter, as the Blackhawks did come back from a 3-0 series deficit, only to lose in Game Seven. With all the changes that were in place for the Blackhawks, it seems only fitting that the captain be the one to pick up all the slack for the team, leading by example. Jonathan Toews did exactly that in the 2011 season, finishing with 76 points (32 goals and 44 assists) in 80 games, ranking him 26th in pool scoring, 12th among all forwards. Toews has consistently improved his pool ranking in his early years in the NHL, which bodes well for him next season, possibly rising to the elite parts of the scoring table in 2012. The core group of forwards behind Toews looked pretty good on the scoresheet, which must be why most of them are going to be sticking around for at least another season. Patrick Kane (73 points in 73 games), Patrick Sharp (71 points in 74 games) and Marian Hossa (57 points in 65 games) all looked very good when they were on the ice together, but as you can see by the games played numbers, there were some stretches that saw key players out of the line-up. Rounding out the top forwards were Tomas Kopecky (42 points in 81 games) and Michal Frolik (38 points in 80 games between Florida and Chicago). On the blueline, it was a lot more of the usual suspects holding down the fort, but in a little bit of a different order. Brent Seabrook led all Chicago defensemen in scoring in 2011, finishing up with 48 points in 82 games, only 3 points better than teammate and Norris Trophy winner, Duncan Keith (45 points in 82 games). Brian Campbell fell off his usual scoring pace a little, finishing 3rd in blueline scoring on the team with 27 points in 65 games. There was a significant drop off in blueline scoring after the top two, which could be one of the reasons why the team struggled at various points in the season. The goaltending story may not have panned out like many had believed it would, but nevertheless, the Blackhawks must be proud of one of their own prospects, Corey Crawford, taking the reins of the starting job and running wild with it in 2011. The Blackhawks signed Marty Turco in the off-season to help ease the loss of Antti Niemi, but it was Crawford who came up big for Chicago, driving their playoff hopes into the first round against the Canucks. Crawford won 33 games, had 4 shutouts and added an assist for 75 points in the pool, ranking him 15th among goalies. The Blackhawks then rewarded him with a brand new deal for his efforts. I don't think anyone can really deny that the Blackhawks do have one of the more promising core groups of players in the league, but it can likely be argued that they may be overpaid or being paid for way too long. What this group of players will do is test management to see how well they can find quality depth to play with this core group on the cheap. There is plenty of promise there, it just needs a little bit of help to move forward again. Turning back to how expensive this team actually is, the 12 players (six forwards, five defense and one goalie) above that are signed and likely to start the 2012 season, have an annual cap projection of $50.9 million, which is an awfully high mark. This means that the Blackhawks will have about $11 million to spend on 11 players, which doesn't sound so bad, in theory, but they will need a top six forward in there, which may cost them down the road. Unrestricted free agency may be a walk in the park for the Blackhawks, as the top players that qualify for the open market are not likely to return, either due to cost or usefulness. Tomas Kopecky, Marty Turco, Fernando Pisani, Jassen Cullimore and Ryan Johnson may all have the feeling that they've become obsolete in the Chicago system. The restricted free agents may be a different story, but then again, if the price isn't right in early negotiations, they may not be qualified and then sent free into the open marketplace. Michal Frolik, Troy Brouwer, Viktor Stalberg and Chris Campoli will all fit under that umbrella, while Jake Dowell, I could see taking what is given to him as a qualifier and just being done with it all. This year might just be the year that Kyle Beach busts out of his shell and joins the Blackhawks roster out of training camp. The big gritty forward has not been able to make that leap in a few years of seasoning and with a fair-sized entry-level cap hit, he may still drop a peg or two in the depth chart. Jeremy Morin looks to be a bit more of a lock for the 2012 season, he played in nine games with the club in 2011 and showed some flashes of razzle-dazzle, which could be put to good use in the team's top six. Finally, the Blackhawks are expecting to see Marcus Kruger in a full-time role next season, likely getting some solid bottom six minutes. It may not translate into many points though. There is plenty of prospects in the system that play along the blueline for Chicago, so if there was anything that the Blackhawks may be looking for with their first pick in the draft, it may be either a flashy forward or a top flight goaltending prospect to help the team with their depth at that position. I would think that the team would lean towards more scoring, since the goaltending prospects are not as highly touted this year, but with draft picks moving back and forth, they might just move one up. What I said last year at this time... "For 2011, I could probably offer some guesses as to who would be out the door to make room for others, but I think I will save that for my rumours blog and I might just do that for all of you. Yes, the Blackhawks will be systematically taken apart by only small bits, but what the core is made up of will remain and be good for poolies across the continent. I'm expecting to see some more dominance from the Blackhawks, likely using those young legs to another good playoff run. I think the Penguins are a good example of being able to make those runs for a couple of years in a row. Make the Blackhawks a priority for your regular season draft and likely your playoffs pool as well." Obviously, not knowing the full extent of how bad the dismantling of the Blackhawks would be in the Summer of 2010, I was very optimistic that the Blackhawks would bounce back from a hard Summer of retooling and cap structuring and then make another big run for the Cup in 2011. Well, I was admittedly unaware and therefore wrong, as Chicago took a tough one on the chin and picked up enough pieces to make the season relatively bearable and just limping into the playoffs. In all honesty, I don't mind being wrong about this one. The 2012 season's success will have a lot to do with the team's depth and their ability to keep the puck out of their own net. Crawford's playoff success won't likely translate fully in the regular season, as the level of play increases exponentially, so the team will have to help that along with some savvy acquisitions. Toews, Kane, Keith, Seabrook, Hossa and Sharp will all be reasonable picks in the coming year, barring injury, which should keep the Blackhawks as a threat on any given night. I'm expecting the Blackhawks to be a quick team again in 2012, definitely pushing for home-ice advantage in the playoffs. There were a lot of question marks about the Canadiens going into the 2011 season, most of which surrounded the goaltending decisions of management, letting Jaroslav Halak go in a deal to St. Louis and choosing Carey Price as their goaltender going forward. This proved to be the right move and the Canadiens management came away like geniuses, having one of the league's best netminders, finishing 2nd in the Northeast Division and then giving the newly crowned Eastern Conference champions a run for their money in the opening round of the playoffs. I would say that is a pretty good year and they have some room for improvement to address. Just how good was Carey Price in the 2011 season? Well, he finished 6th in overall pool scoring with 38 wins, 8 shutouts and 2 assists, giving him 94 points in the year. He was the second best goalie in the entire league, behind Henrik Lundqvist, for pool points and likely an excellent bargain in most pool drafts, as the question mark that hung above his head loomed large, decreasing his pool value potential. The forwards for the Habs were less than sparkling in the goal scoring department, as no one really stepped up to the forefront to deliver on a regular basis. There was a lot of scoring by committee, as you might be able to tell from some of the numbers I am about to reel off. Tomas Plekanec led all forwards with 57 points in 77 games, good enough for 80th overall in pool scoring. Mike Cammalleri (47 points in 67 games), Brian Gionta (46 points in 82 games), Andrei Kostitsyn (45 points in 81 games) and Scott Gomez (38 points in 80 games), all were somewhat disappointing, especially for poolies that had faith in these players. The defense had its fair share of woes as well, but I think most of those were in the health department more than any other real concern. They did, however, do something about it, acquiring James Wisniewski from the Islanders, who provided a shot in the arm of the team's power play, finishing up the season with 51 points in 75 games, ranking 5th among all defensemen in scoring. That is very impressive. P.K. Subban finished his first full season with the club, 38 points in 77 games for the rookie was also quite good, while Roman Hamrlik had 34 points in 79 games this season. No Andrei Markov or Jaroslav Spacek on this list may have made you look twice. Only one goalie was needed to play behind Price in 2011 and it was Alex Auld that got the call... rarely. Auld only had 748 minutes on the ice, which works out to be about 12 games, winning 6 and adding an assist for 13 points on the year, finishing 59th among all goalies in the league in pool points. When your minutes are limited, so is your pool value. Much like the outlook from last year, it's another small bunch of players for the Montreal Canadiens leading into the Summer. Price checks in as the biggest player of the bunch and he isn't skating around making good use of it, rather he fills up the crease fairly well with it. With the Canadiens doing well in the standings in 2011, I don't see any reason as to why they would buck this trend of smaller, faster players, trying to outpace their opponents night after night. If they can find someone who would drive the opposition net more often in the same mould, they might really do some damage. Unrestricted free agency has really cleaned off the shelves in Montreal, allowing management to nearly start fresh with a core group of players. Right now, I have the Canadiens with six forwards, two defensemen and a goalie, plus a buyout, in with a projected cap hit of $34.1 million. That should leave around $28 million, with the new increases in salary cap measures, to fill in 14 players for a 23-man roster. That should work out quite nicely for the team this Summer. The unrestricted free agent crop is fairly deep, especially on the point, which may or may not cause a complete refresh of the team's blueline this year. James Wisniewski, Roman Hamrlik, Hal Gill, Brent Sopel, Paul Mara and Andrei Markov are all set to be on the open market, barring a signing before July 1st. Mathieu Darche, Jeff Halpern and Alex Auld are also set to become free agents in July as well. The restricted free agents won't be a picnic either, seeing Andrei Kostitsyn, Benoit Pouliot, Max Pacioretty, David Desharnais, Yannick Weber, Alex Picard, Tom Pyatt, Josh Gorges and Ryan White all have their contracts end on July 1st as well. That's a lot of decisions and negotiations to come in Montreal this Summer. Up front, I would wager a guess that we'll see some offensive upside from Louis Leblanc in the 2012 season, same kind of frame as the rest of the team, but adds some youthful enthusiasm. The team might get some good bottom six minutes out of newly-signed Joonas Nattinen, who is being hailed as a solid two-way forward with a knack for face-offs. On defense, I think there is a shot that the Canadiens will sign their 1st round pick from last Summer, Jarred Tinordi, who would provide some much needed size in front of Price, likely at a cheaper rate than one or two of the free agent defensemen on the list. I may have suggested that if there was a French goaltender in the top rankings for this Summer's draft, that they would likely go out and snap him up in the 1st round, 17th overall. There isn't, so I would look for the Canadiens to maybe look to bulk up again on defense, much like Tinordi last Summer. The forwards can be as small and speedy as they like, but I think the Canadiens may be realizing that size on the back end, along with a powerful shot that comes with it, is definitely an asset worth collecting. What I said last year at this time... "For 2011, I will be preaching hesitation with the Canadiens. I am a fan of Mike Cammalleri's, but the Habs will have to make him a happy camper with some healthy help, because I get the feeling that they will remain as injury-plagued players, with no enforcers to help police their line-up from goons in the Eastern Conference. They will likely assume some wins in straight up skill match-ups, since Cammalleri, Gionta and Gomez will still be about, not to mention skill from the blueline, but unless they pick up some more grit (besides some of the pests on the team), they will be run over quite frequently. Look for the Canadiens to be bargains more than cornerstones of your fantasy team, but telling Habs fans that is a tall order." Hesitation, especially with the forwards, was well warranted in the 2011 season, as they were not at all spectacular. Of course, Carey Price had an amazing year with the Canadiens and he could have been considered a cornerstone, depending on your confidence in him back in September, but he was more likely one of the biggest bargains in the hockey pools from coast to coast. I didn't talk much about how the Habs would finish in 2011, but I think the tone in my prediction suggested that it may not be a great year for them, to which I would say was pretty much incorrect. Nevertheless, quite a bit of that paragraph was right, the team just had one amazing run by the goalie they decided to keep, rather than trade away. Things I will assume for the 2012 season: 1) Carey Price won't have quite as good of a year in 2012, likely a lot of teams had a good look at him in the Bruins series and made some notes; 2) P.K. Subban is another year older and another year wiser, which actually bodes well for the team and the decision of where to put him in the depth chart, affecting the decisions of who to re-sign for the blueline; 3) unless the team gets a smidgen bigger in their top six, the offense will stay about the same in 2012. That all being said, the Habs will be quick, Price will get plenty of wins, but they should find themselves back in the bottom half of the East playoff race again, possibly dropping a few points from the 2011 season. It was quite the season for the Buffalo Sabres, as the team really turned some heads and made a good run into the playoffs, finishing 7th in the Eastern Conference and taking the Philadelphia Flyers to the limit in the first round of the playoffs. The Sabres were a good scoring team, finishing 4th in the Conference in goals for, but some defensive struggles were likely to blame for the 7th place finish. Nevertheless, the Sabres showed some good fight and they have lots to build from going forward into the 2012 season. It was a bit of an up-and-down year for Ryan Miller and his Sabres, but the world class keeper did get his game together and the Sabres did a great job of stringing some wins together and made a good season out of it. In the end, Miller finished with 34 wins, 5 shutouts and 2 assists for 80 points in the pools, finishing 20th overall in scoring, 11th among goaltenders, just slightly down from his 2010 numbers. The Sabres go as far as Miller goes, with a little bit of help, of course. It was a great return to form for Thomas Vanek in 2011, as he finally jumped back into the ranks of the top scoring elite, finishing the season with 73 points in 80 games, ranking 32nd in pool scoring, 17th among forwards, up drastically from 2010, where he finished 103rd overall. The Sabres went out and acquired some talent at the deadline, snapping up Brad Boyes from St. Louis, he finished the season with 55 points in 83 games between the two teams. Drew Stafford (52 points in 62 games), Jason Pominville (52 points in 73 games) and rookie Tyler Ennis (49 points in 82 games) rounded out the scoring for the Sabres, who desperately missed Derek Roy (35 points in 35 games) all year as well. There was a definite slump to Tyler Myers' game at the beginning of the season, as he had a hard time adjusting to the big game again in his sophomore season, but did eventually come back around to lead the team in blueline scoring with 37 points in 80 games. Myers ranked 32nd among defense in pool scoring in 2011. Jordan Leopold had a good year with the Sabres in 2011, picking up 35 points in 71 games for Buffalo in the season, as did Andrej Sekera (29 points in 76 games) and Steve Montador (26 points in 73 games). The Sabres defense proved to be a quiet gold mine for blueline points. A new back-up emerged for the Sabres in 2011, as Jhonas Enroth was the back-up of choice down the stretch, coming up from the minors on a regular basis to give Miller a night off, likely with a lack of trust in Patrick Lalime, who played as Enroth's back-up when he was up. Enroth finished with 9 wins and 1 shutout in 2011, giving him 20 points in 769 minutes worth of action. The Sabres back end, which arguably gave them a lot of trouble in 2011, may see quite a makeover, in terms of its depth for 2012. There are plenty of free agent questions that the team can ask of itself and now that the team has an owner that wants to invest money in the team to make it better, there won't be any settling on players for cost efficiency reasons. The Sabres have some real promise in the coming year and a good core to build from. Going into the Summer, the annual projected cap hit for the eight forwards, three defensemen and goalie, plus a buyout still on the books, is at $40.8 million, just a few million shy of the 2011 cap floor. If there is an increase, the Sabres may have around $22 million in cap space to work on moving in 11 players onto their roster for the 2012 season. It's an interesting group of restricted free agents for the Sabres this Summer, led by Drew Stafford and Nathan Gerbe, Buffalo will have some interesting decisions to make, especially now that they have some more money to play with. Also in the RFA group, Andrej Sekera, Jhonas Enroth, Mike Weber, Chris Butler and Marc-Andre Gragnani. The unrestricted free agents may have a little bit more to worry about, again since the team isn't likely going to settle on players until the market is all dried up. Tim Connolly, Steve Montador, Cody McCormick, Rob Niedermayer and Mike Grier are all potentially heading to market and I could potentially see a few of them leave for greener pastures. It doesn't sound like the Buffalo Sabres will be a smaller team for very much longer, as they are on the verge of adding three new prospects to their everyday line-up, each having some real size. Zack Kassian, Luke Adam and Marcus Foligno are all signed and ready to go for next Fall, when training camp opens, and I think there is some belief that all three have a very good chance of graduating into the system. All three rank very well with the Hockey News' Future Watch and all have made an impact with their junior teams or in Adam's case, with the minor league affiliate. All three may be decent picks for the pool as well, if you need youngsters. The Sabres carry the 16th overall pick into the entry draft this year and since they have some youth in their system that is just about ready to go, I think the Sabres will be looking for a little bit more size, either up front or on the blueline, and doesn't need to be rushed into the line-up. Now that the team is midway through the round, I think they can find a kid that can spend another year in junior, a year in the minors and then be ready to go. Develop at the team's pace... that's the key. What I said last year at this time... "For 2011, I think a lot of the same principles apply that I had going on last year. You have a look at your definites, like Miller, Roy, Pominville and Vanek, you can add Myers to the list if you like, but I will still remain hesitant on recommending Connolly for any sort of hockey pool, because he is still such an injury risk. If Ennis can pay off in the coming year, the Sabres should have enough scoring to improve their point total from 2010, likely capturing another division title." The favourites were pretty good picks, barring injury, but injuries did catch up to Roy and Pominville, which no one can truly foresee. Connolly only missed 14 games, but had some pretty poor-ish numbers, compared to the pace he's used to score at. Ennis did play the entire 2011 season, put up some okay numbers, but it was the defense that let down the Sabres or else they may have had a better run at the Northeast Division. I think there will be some serious improvements in the 2012 season for the Sabres, from top to bottom. Miller, Vanek and Myers should be locks for good seasons, I would expect a better season from Stafford, Pomiville, Roy and Gerbe, but possibly a down year for Ennis. Throw in some new faces, a bit more confidence with Boyes in the line-up and you have a pretty good Sabres team that should look to surprise a number of unsuspecting teams in the East. The Sabres will make the playoffs, even contend for home-ice advantage, in some capacity. The New York Rangers, the first of the teams that made the playoffs, but couldn't make it out of the first round after a loss to the Washington Capitals. The Rangers slid into the playoffs using a Hurricanes loss in the final days of the regular season to do it. It wasn't a very good season in the Big Apple, the Rangers were only as dominant as their number one goalie was most nights, but there wasn't a lot of depth to put the fear in other teams, either at home or the road. On the flip side, the Rangers did show some positive direction with where the club was going, so if they can keep building on their own momentum, they may be all right down the road. I don't think there is any surprise that Henrik Lundqvist was the best player for the Rangers in the 2011 season, he was the best goalie in pool points, finishing with 36 wins, 11 shutouts and 4 assists for 98 points, good enough for 4th in pool scoring overall. Lundqvist didn't get a lot of scoring help this past season, so he had to win a lot of games by not giving a lot of goals, but there were just some nights where he had no help and surrendered a good number of goals against. Lundqvist, in my opinion, is an under appreciated talent, since he didn't earn a Vezina finalist nod this year. It wasn't a solid scoring year for the Rangers forwards, as only one forward finished in the top 100 of pool scoring this year, Brandon Dubinsky finished with 54 points in 77 games to lead all blue shirt forwards. Ryan Callahan (48 points in 60 games) and Marian Gaborik (48 points in 62 games) were the only other two forwards to finish among the top 100 forwards in the league in 2011, showing you first hand, just how underwhelming this team was offensively. Sure, injuries played a large part of it, but I think there was a definite case for poor chemistry as well. Rounding out the top five forwards on the team, Derek Stepan had 45 points in 82 games as a rookie and Artem Anisimov finished with 44 points in 82 games as a grinding winger. I don't think there was much that Dan Girardi didn't do for the Rangers in the 2011 season. The blueliner led all defensemen on the team in scoring, finishing with 31 points in 80 games, blocked more shots than any sane person would want to and led by example. Girardi did receive some help from the team's best young defenseman, Marc Staal, who finished with 29 points in 77 games, earning lots of praise for his defensive ability and the growth of his offensive game. Finally, a trade deadline acquisition, Bryan McCabe finished the year with 28 points in 67 games between Florida and New York, but really didn't prove to be a great pick-up by the Rangers in the end, not improving their power play a great deal. Much like many teams I've already had a look at in these pool outlooks, the Rangers also rode one goaltender for much of the regular season and when Martin Biron suffered a broken collarbone at the beginning of March, that spelled a lot more time in the crease for Lundqvist. Biron finished the year with 16 points in 17 appearances for the Rangers, ranking 57th among all NHL goalies in pool points, despite missing the last six weeks of the season. If we learned anything about the Rangers in 2011, it was that they looked a lot of their cap problems in the eye and then buried them in the minors. In order to keep a good chunk of the core group together in 2012, I am expecting to see Wade Redden remain in the minors and start building around what they have already. On paper, the core group below doesn't look too bad, but there are certainly fears of inconsistency throughout, something they will have to overcome. There are still some big ticket players on this Summer's preview version of the Rangers' line-up, which makes the math a little bit more interesting to work around. The eight forwards, four defense and two goalies come in at $42.1 million against the cap, which should leave about $20 million for nine more players in the off-season duties. Over the past year, the Rangers have done a good job paring down their cap woes, especially since they were nearing dire straits a few years ago. The restricted free agent crop of Rangers will be a very important hurdle to leap this Summer and it should chip away at the remaining cap space quite quickly. Brandon Dubinsky, Ryan Callahan (pictured), Artem Anisimov, Brian Boyle, Michael Sauer and Matt Gilroy are all headed to free agency this year and three of them could turn into medium-to-large ticket players with proper negotiations. Re-signing this lot should be very important to Rangers management, but "how savvy can Glen Sather get?" will be the real question. As much as the RFA group is important, the unrestricted free agents pack some real punch as well. Bryan McCabe, Ruslan Fedotenko, Vaclav Prospal and Steve Eminger are all primed for the open market in July and I would imagine at least three of them hit the ground running to new teams. The only one I can see sticking around would be Prospal, possibly taking a little less money as a 36-year old with good chemistry with Gaborik. If the free agent crop is to keep from returning, the Rangers may have to look from within to find some help on the roster. Unless there is a player with Stepan-like upside as a teenager, I would imagine that the Rangers would be looking towards players like Evgeni Grachev, Dale Weise and Ryan Bourque to step in up front, all into their 20s and have been developing at a reasonable pace, either in the minors or in their last year of juniors. The Rangers do have more blue chip talent in their system, but I don't see them being rushed into the league next season. The Rangers will pick 15th in the 1st round of this year's entry draft and I think they can go in any direction, likely going with the next best player available. The Rangers have all kinds of talent up front and on the blueline, lots of investment in Lundqvist in net, so anything would be good for the Rangers this year. If they go with talent up front, look for them to pick up a centre and if the Rangers look to the blueline, I would imagine it would be for more puck moving than size. What I said last year at this time... "As for 2011, the Rangers are still being weighed down by some heavy cap contracts in Redden, Drury and Rozsival, which likely cannot be moved easily, if at all. The only player I expect better things from in 2011 is Rozsival, but even then it's a bit of a stretch. The Rangers will definitely be in the hunt for the playoffs, either just making it or just missing it, but it's going to be close again. The Rangers will ride heavily on their veterans to see the young kids through a grueling season, but improvements will definitely be in store for Del Zotto, Staal, Callahan and Gilroy." The Rangers made it into the playoffs this year, by the skin of their teeth, largely on the backs of their veterans. They were able to deal with a all of those larger contracts, dealing Rozsival away, sending Redden to the minors and Drury hit the Long-Term Injury Reserve for most of the season, so their trouble were very limited there. Staal and Callahan made improving strides in 2011, Del Zotto dropped off in his sophomore year and Gilroy stayed the same from 2010. The 2012 season appears to have the same sort of outlook to it as 2011 did, another close finish at the end of the year is likely in their future. With whispers of the possible acquisition of Brad Richards on July 1st, the Rangers could make that move into the upper echelon of the Eastern Conference, but it will come at some significant cost. As of right now, however, with the team that is signed on and their RFAs that need to be signed, the Rangers will likely finish in the 6th to 10th place range, battling for their playoff lives in the stretch run yet again. The blueline will likely see some more improvement, as Staal and Girardi continue to lead, Del Zotto bounces back a bit and McDonagh turns into an everyday guy. Until they can land a playmaking centre for Gaborik and/or Stepan, I don't expect a great deal of offensive improvements in New York. Home-Ice Advantage to Continue in San Jose?